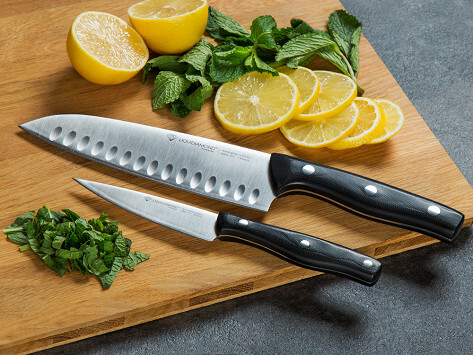 This set of ultra-sharp kitchen knives is built tough enough to last a lifetime—guaranteed. The blades are made by bonding an amorphous metal alloy edge to a high quality stainless-steel knife body. Each is finished off with a military-grade tough handle that makes for an exceptionally durable knife. Dimensions: 15.25" x 3.125" x 2.5"
Weight: Chef Set: 1.42 lbs. 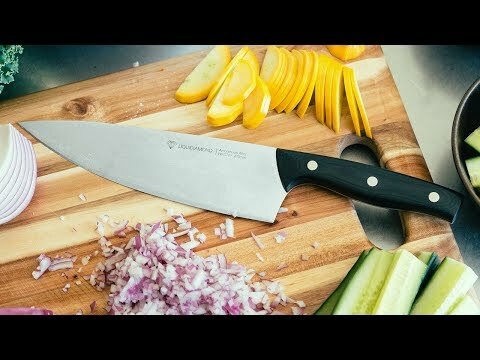 ; Santoku Set: 1.37 lbs.